London Fashion Week has finished, however the style never ends. Many lovely ladies were photographed journey the week with amazing outfits, makeup and hair. This is why I decided to show you some of my favorite 'Street Styles' from LFWSS15. I'm a huge fan of the blogger/ YouTuber Amelia Liana featuring below. As you would expect from a Fashion blogger for effortless style, she certainly achieved a rocky vibe with a leather peplum skirt, knee high boots and a cute white shirt. Her hair was beautiful, flowing in loose curls alongside her minimal makeup. These ladies, whoever they are, brought sophistication to the streets this fashion week. Wearing a mixture of fur, animal prints and cute designer back packs, were defiantly a win-win. Personally my favorite out of the three looks is the woman on the left, her coat compliments her bright red lipstick alongside her wonderful shoes. You can tell, just by glancing at her, she is a high-end fashionista. A matching dusty pink suit alongside a simple white jumper, grey tote bag, leopard shoes and large sunglasses creates a simple yet elegant look. If you live in the UK and watch ' Made in Chelsea', you will probably adore this next outfit. How clasy does she look? From the floppy black hat, navy cape dress to the simple black boots she's dripping in fashion envy. Once again I love this hair style, loose curls that create the girly touch to a modern look. Sammi is a popular YouTube/ blogger also, so once again my smile didn't falter when I saw her outfit. Monochrome is my favorite fashion trend at the minute, so simple yet so great. I love her combination of a bold check print against a big fur coat hanging loosely around her shoulders. 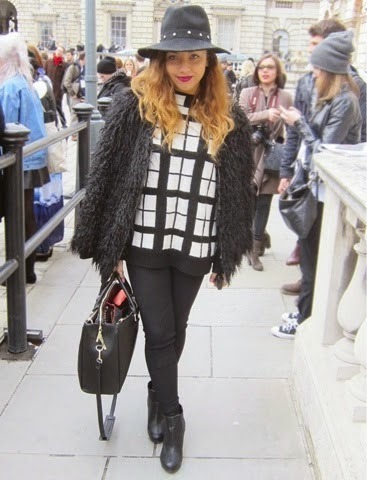 Alongside her floppy, studded hat and dark berry lips, really compliment her style. Tanya Burr is one of my favorite YouTubers and also is wearing one of my favorite looks! I love her 'leather' theme, wearing a matching leather crop top alongside a leather midi skirt, strappy sandals and of course the beautiful Mulberry bag designed by Cara. Hair in loose curls seems to be a trend that Tanya has caught on, alongside a simple smokey eye look. It's even more impressive as she revealed on her YouTube channel how she only decided what to wear that day for when she was attending Burberry!! Tartan is becoming increasingly popular and it appears this lady knows whats what! I love her style so much! The black crop top, tartan pencil skirt , platform shoes and leather bag make her the perfect fashionista for Autumn. She looks stunning in her simple pony tailed hair, little makeup and beautiful figure. TTwo huge names amongst the fashion world, blonde bombshells, Kate Moss and Cara Delevingne. Both with hair simply straightened. Cara wore a plain two piece suit, exposing her slim figure, trainers to match her cool life style and of course her own bag. Alongside her Kate looked mature in her large sunglasses, black trench coat, leather trousers, fur bag and of course heels.